Explore, discover, imagine, write, and learn! 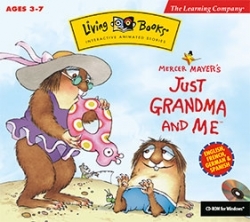 With "Just Grandma & Me" your young stdents will experience the charm of Mercer Mayer's best selling Living Books creation, in an entirely new way! It's the orginal interactive story-book enhanced with hour of interactive fun and skill-building activities. Whether the story is new or familiar to them, kids will delight in exploring the freshly animated world of Little Critter and his lovable grandman. Switch among English, French, German and Spanish on any screen, at any time. With "Just Grandma & Me" your young stdents will experience the charm of Mercer Mayer's best selling Living Books creation, in an entirely new way! It's the orginal interactive story-book enhanced with hour of interactive fun and skill-building activities. Want To Tell A Friend About Smart Kids Software! !